The Entertainer has more than 100 stores in the UK, and stocks thousands of products online. With 30 years experience in the retail industry, there's not much they don't know about toys. They're experts in what kids love, and their winning combination of fair prices and excellent customer service means they're a favourite with mums and dads too. 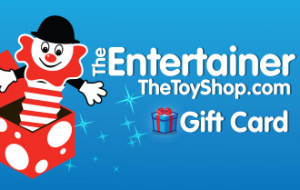 You can use this voucher to buy 1000s of toys and games online at TheToyShop.com or at any Entertainer store. Go to TheToyShop.com and enter your voucher number and PIN on the payment page. Visit any Entertainer store and show them the barcode on your voucher at the till (you can print it out or show us this email on your phone or tablet). Find your nearest store.